This super-soft t-shirt looks great on both men and women. Women should order one size smaller than usual, if you wear a women's MEDIUM order this unisex in a SMALL. Use the chart below to help you decide what size shirt to order. You can use the first chart to compare our shirt sizing to ones you already own. Use the second chart to see the suggested size based on the measurement around your chest. We create your product AFTER receiving your order so expect about 7-10 days to receive your order. We ship worldwide. CONTACT US if you don't see a shipping option available for your country and we will make it happen. We are currently printing this design on BELLA + CANVAS 3001 Unisex Short Sleeve Jersey T-Shirts due to their comfort, fit and quality. All shirts are printed on using Direct-to-Garment (DTG) technology, which lays down soft full color spectrum prints. 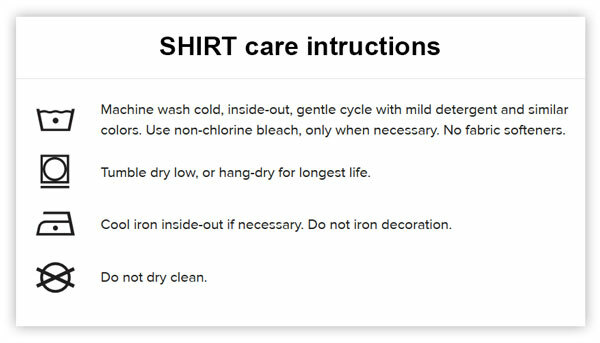 Scroll to bottom of page for the best way to care for your garment.